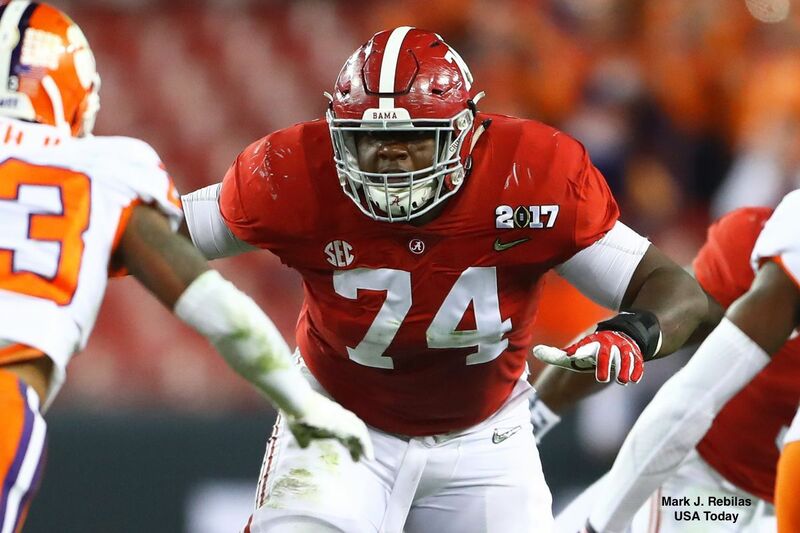 Evaluating Cam Robinson led to a wide variety of opinions on how good he was currently and how much better he could be in the future. It led some prominent media analysts to compare him to Ereck Flowers, or dismiss his chances of playing offensive tackle altogether, and project him inside to guard. Studying Robinson’s 2015 and 2016 film, along with being familiar with him since his freshman year led me in a totally different direction. Coming out of Miami, Flowers had inconsistent hand usage that was seemed fixable enough to get drafted ninth overall in 2015 based on his impressive size, length, and power. Those are great traits to have for an offensive lineman, but it’s often thought that a key trait like hand usage is instantly “fixable” once in the NFL, however, oftentimes it’s one of the more difficult aspects of OL play to master. This is where the Robinson and Flowers comparison falls apart for me. I view Robinson more in the mold of a Russell Okung type of skill set, possessing the necessary hand usage required to be a good pro that Flowers simply lacks. I do agree with the sentiment that Robinson has room to grow, however, my view of where he is already made Jacksonville drafting him 34th overall one of the top steals in the draft. Robinson started every game he appeared in at Alabama (43) since he was a true freshman, all at left tackle. At 6’6”, 322 pounds with 35 ½” arms Robinson possesses excellent size and length that fit the mold of a starting LT in the NFL. Coupled with very good play strength, athletic ability, competitive toughness, and hand usage, there was a lot to like about Robinson’s skill set transitioning to the pro game. Robinson’s base and balance issues largely stem from the inconsistent platform (stance) he operated out of at Alabama. Once he hammers down a consistent stance, I foresee the majority of these issues subsiding with time and reps. The Jaguars enter the 2017 season with a new coaching staff and Tom Coughlin as executive vice president of football operations. Coughlin’s desire for players with high competitive toughness and physicality has been evident since he took over this offseason and Robinson fits that mold as a tone-setter on the line of scrimmage. Additionally, new head coach Doug Marrone has an extensive background as an OL coach, and was the Jaguars OL coach in 2016 before being promoted. Jacksonville’s new OL coach is Pat Flaherty, a 35-year veteran of the OL coaching community, who coached for Coughlin previously with the New York Giants. 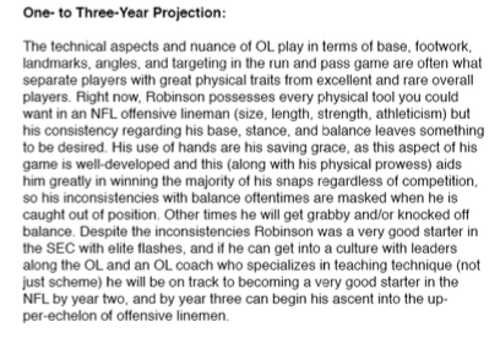 This OL-friendly environment bodes well for Robinson’s development in terms of gaining consistency and learning the nuances of the position. An area that Robinson consistently excelled at on film was his display of mobility throughout his lower half, particularly through his ankles, hips, and core. This coupled with very good hand usage allowed him to achieve superior leverage on defenders in both the pass and run game. Context: Week 5 at home against Kentucky. It is the first quarter with 12:13 remaining, the score is 0-0 and Alabama faces 2nd and 6 from their own 31-yard line. Robinson comes out of his stance smoothly, hits his set point, and intersects the rusher with a powerful initial strike with his outside hand. Robinson immediately follows that up by latching onto the rusher with his inside hand to gain leverage prior to gathering his feet to transition into his anchor. He syncs his feet with his hands, shows good mobility in his hips as well as the necessary balance to generate power from the ground up. This halts the rusher and allows Robinson to win the block by winning the leverage battle. Context: Week 8 at home against Texas A&M. It is the first quarter with 0:51 on the clock. The score is 6-0 Alabama. The offense faces a 2nd and 5 from their own 33-yard line. Robinson is tasked with kicking out the 5 technique to create an alley for the runner. Here we have Robinson demonstrating the ability to flex and extend at the hip, getting underneath and exploding into the defender to generate movement in the run game on a kick-out block. His hand placement is also on point here, creating the necessary leverage to control and steer. Robinson executes another angle-drive block, this time against Aggies DE and #1 overall pick Myles Garrett. This level of mobility and hand usage for a player of Robinson’s size bodes extremely well for sustained success at the next level, particularly when squaring off against defenders who play with good pad level and leverage such as Garrett. Context: Week 8 at home against Texas A&M. It is the second quarter with 5:51 on the clock. The offense faces a 2nd and 10 from their own 43-yard line. The score is 13-0 Alabama and the OL runs half-slide protection to the right, putting the LT/LG in man protection. Robinson executes a smooth 45-degree pass set with excellent punch timing and placement to disrupt Garrett’s rush angle, while showing off his length and reach in pass protection. By getting his hands on Garrett so quickly and maintaining the half-man relationship, Robinson is able to latch onto and control Garrett despite the attempted inside counter. Context: Back to week 5 against Kentucky. Robinson is tasked with blocking down on the 4i technique lined up over his right shoulder in order to make room for the pulling right guard and tight end from the backside. Robinson’s initial fit on the DL is a good display of lining up a target and latching on with good hand placement. Robinson uses his grip strength to create leverage and control his opponent despite his best efforts to disengage and make a play. Robinson overwhelms the run-defender and takes him entirely out of the play. These next two clips show Robinson fitting on first-level defenders on an outside zone run. Not only does he fit with good hand placement to create leverage, he sustains the blocks with a strong base, and gets the opponent’s shoulders turned on each rep. Context: Week 6 at Arkansas. The offense leaves the playside defensive end unblocked due to the read / option making the DE irrelevant, so Robinson works to the most dangerous man on the second level. Here Robinson does a very nice job of expanding and gaining ground inside at the snap to clear the DE, followed by a sharp change in his angle moving upfield to cut-off the backside linebacker. Robinson puts himself in position to intersect the pursuit angle of the LB, working in space efficiently using good angles to fit on and engulf the LB at the POA. Next, Robinson shows good mental processing to quickly react to the stunting defender crossing his face in the B gap while still blocking an additional defender over the top from pursuing the ball carrier. There is no wasted time as Robinson secures the first-level defender before finishing with a two-for-one block that helps provide a cutback lane to spring the runner for 57 yards. This level of proficiency in his hand usage is rare to see at the college level and is a good representation of the refinement Robinson possesses with his hands. His understanding of leverage is also on display throughout these clips, along with the ability to decipher when a pass-rusher is leaning and susceptible to lose their balance on a power rush. The Jaguars traded for OL Branden Albert this offseason to take over the LT position, but he has not showed up to any of the voluntary offseason workouts, reportedly wanting a new or restructured contract. Despite the breakdown in communication between the 32-year-old Albert and the team, Robinson has benefited as the guy who is taking the first-team LT reps in practice. While it’s likely Albert reports in at some point, the more reps Robinson gets as the starting LT the less likely it appears that Albert will walk into the job without facing significant competition. Ironically, Albert was involved in a similar dynamic last season in Miami when the team moved their first-round pick Laremy Tunsil inside to LG with the intention of him eventually taking over at LT. With another year of wear and tear under his belt, Albert is losing leverage to be handed the LT spot over the future of the position for a second consecutive season. Throw in the fact that Albert came in ranked as the 25th best LT in the NFL last season according to Bleacher Report 1000’s Duke Manyweather, and the margin for error for Albert is increasingly shrinking. Robinson is ready to play a major role in the initiation of the team’s new offensive ground-and-pound identity that should feature heavy doses of RBs Leonard Fournette, Chris Ivory, and T.J. Yeldon. The Jaguars are in a comfortable position having a rookie in Robinson who is ready to make an impact at LT if needed, and the potential luxury of upgrading the LG spot if / when Albert decides to show up. Follow Brandon on Twitter @VeteranScout. Read more of his work here, including his other 2017 NFL Draft Under the Microscope pieces on Pat Elflein and Ethan Pocic.